Pizza. Again. I try to put on a happy face when I’m getting lunch in the cafeteria. It’s getting harder. 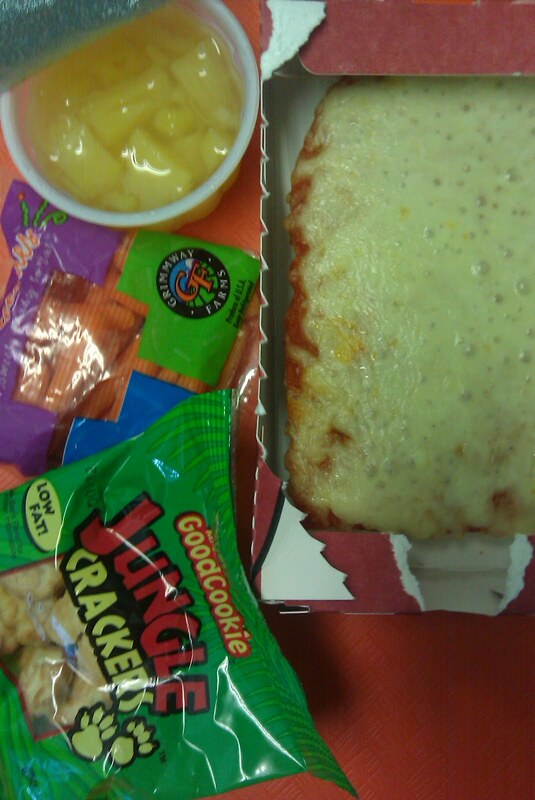 I mean, I have to pretend that I’m eating the lunches because I like them….a lot. If I pull this whole project off, I should be nominated for an academy award. Well, anyway I’m grateful for the carrots. And the cookies are “healthy.” They don’t taste as sweet as cookies normally do and if you look at the ingredients there are some “good fats” in them (polyunsaturated, monounsaturated). The past two weeks have been pretty exciting for the blog. Two weeks ago I was interviewed for AOL Health and that article was featured on Yahoo!’s homepage. Um, Hi new readers! Then last week I was interviewed by Juju Chang and featured on Good Morning America (GMA). Juju Chang flew out to Chicago to interview little old me about the blog. She is a very competent journalist. You know, we talked for 40 minutes and the clip they selected was only 5 minutes! You can read the story and watch the video here. I was ambivalent about doing the interview, but I’m happy I did it. But part of why I agreed to do the interview is that I believe that this cause is most likely more important than me. And to keep my nerves in check, I kept myself anonymous. AND the next day Jamie Oliver called me! His publicist had emailed me wanting my phone number the previous week. Wouldn’t you know it – he actually called me. We chatted for 20 minutes about his experience with school lunches and also what I have been up to. Jamie is a passionate advocate for children’s school food and their health. I’m not going to detail what we talked about because it wasn’t an interview, but instead a deep discussion about school lunches and what the US is up against. It was a high point for me and the blog. Wow. When Juju and I were talking, she called me “an accidental blogger” (I don’t think that comment made it on air). I think that’s an accurate description, but maybe it should be revised to “lucky blogger, accidental activist.” You know, the longer I eat the lunches, the more convinced I am that change needs to happen. I thought that after the GMA interview the traffic to the blog would skyrocket and I’d never get any sleep because of all the email. Maybe a slight bump-up, but not like that Yahoo exposure. I’m relieved because I’m having a hard time managing all of this as it is! The joke around my house is that I just got my 15 minutes of fame, but completely anonymously. And I’m fine with that. It’s the cause that needs the attention not me. Hello from Washington State! As an elementary school teacher and foodie, I’ve been reading Mrs. Q’s blog with curiosity, but have never taken the plunge in eating my school lunch…until today. I had a surprising number of choices for lunch: cheese pizza was the featured item, but a corndog, bean/cheese burrito, and yogurt/blueberry muffin/string cheese were also offered as the entrée. Each month’s menu has a featured fruit/veg/grain – this month had grapes, pea pods and quinoa. A fresh salad bar, additional fruit (dried/fresh/canned) and veg is also provided each day, along with 1% milk or fat-free chocolate milk. I chose the bean/cheese burrito, as I hadn’t had one in awhile (I found out later they’d sold out). It was surprisingly good – better than anything I’d anticipated. 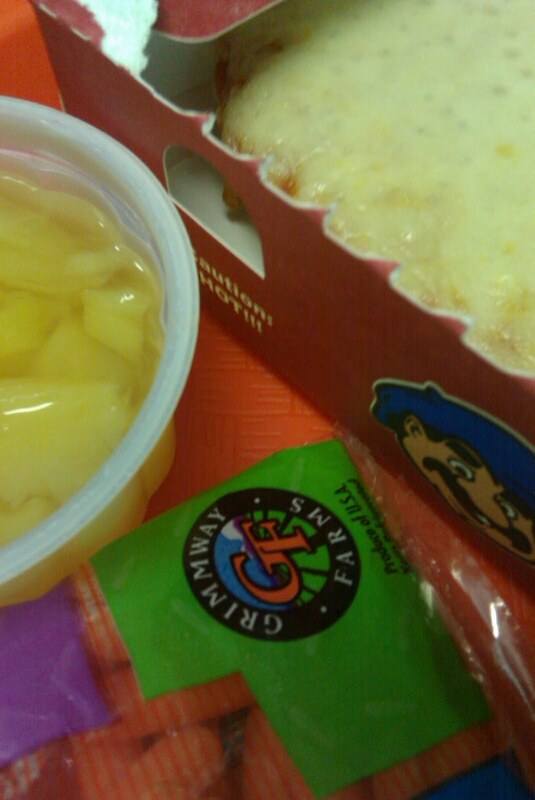 The flavor/texture was spot-on, and the cheese wasn’t rubbery or greasy. In the salad bar, I chose grapes, pea pods and baby carrots. All were crisp and fresh. Also available was a tossed salad, canned peaches and raisins. I didn’t see the grain, but I was excited by the fresh fruit/veg and probably missed it. 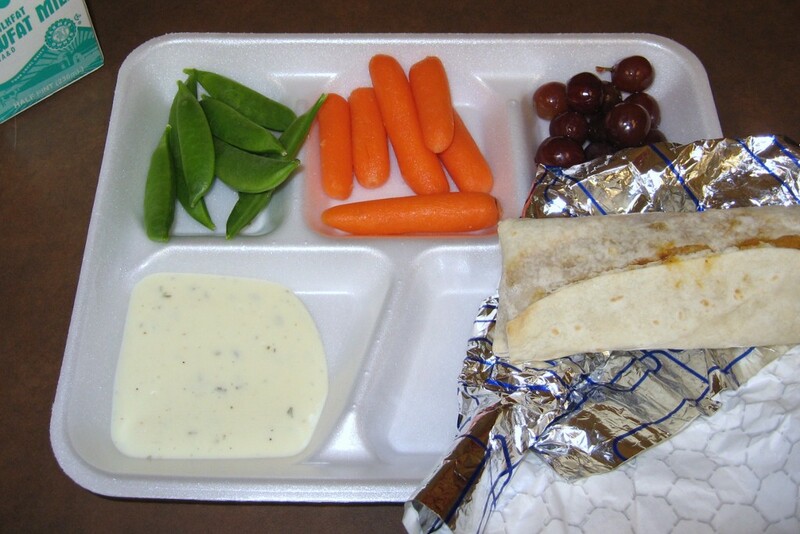 I was happy to have ranch dressing to accompany my veggies, and I saw a few kids with a similar set-up on their trays. Our school kitchen is reheat and serve, but we’ve a few things that make us unique. First, upper-grade students serve the entrée (with gloves, of course), while our lunch lady oversees the line and replenishes food. All kids help themselves to the salad/fruit/veg bar. Our trays, while disposable, are compostable. They cost a bit more, but it’s something our student environmental group supports. Recycling and composting of leftovers from lunches is also in place, helping to reduce the amount of trash produced. Our district also publishes menus and nutritional information online, but not ingredients (that I found). All in all, I was beyond impressed with the lunch. I’d eat it again, if not for the cost – over $3.00. I simply do better packing my lunch each day. 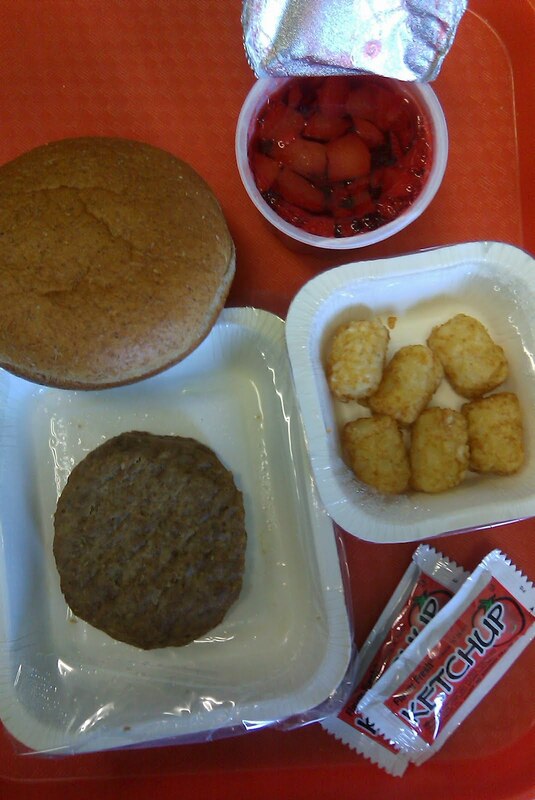 But I’m still impressed bythe nutritious, healthful options my district offers students on a daily basis. I ate everything. Good thing I didn’t forget the ketchup. I just slathered that patty with ketchup to get it down. I’m basically beef-free in my “real” life so this is a big adjustment. I will not be eating beef hamburgers ever again after this “experiment” is over. I’m so done. This week I’ve seen an incredible uptick of the use of the Twitter hashtag #foodrevolution. You and I know it’s bigger than Mr. Oliver’s show. 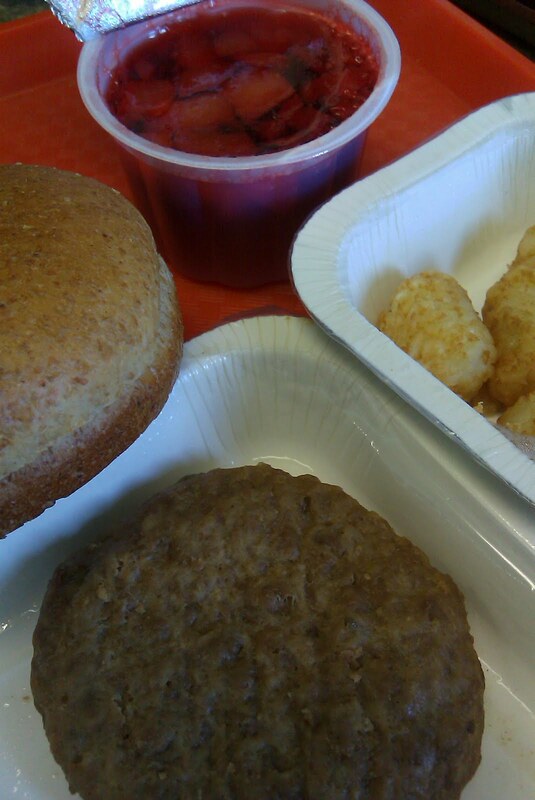 In part it’s fueled by the fact that this week, the traditional media picked up steam on school lunch stories. I guess they were busy reporting last week after all. A big reason for the stories is that the Blanche Lincoln bill passed committee. Here are two stories from Grist, an awesome online source, about why this bill is “dismal.” Of all the pieces I recommend today, these are the two you need to read. A New York Times blog gave Lincoln the voice to say this is just the beginning of the reform process, and also to blame the current dismal funding increase on the need to avoid partisan bickering. I didn’t know she promoted these figures, since Pres. Obama only proposed around a 15-cent increase per school lunch, and apparently settled (placing the fallout on Sec. of Ag Vilsack) for a 6-cent increase. Surely Michelle realizes this. What does she think about it? I don’t mean to put a rift between the first couple, but surely Michelle has some say in what the president does. School lunch reform seems to be her biggest issue. Why is she settling for less? The bill passing committee is an example of a “news peg,” some tidbit of breaking news on which a larger story is hung. But I’m a fan of stories that don’t wait for the officials to make an “official” announcement that’s been brewing behind closed doors for weeks. It seems artificial to me. Here’s an example of a poorly-researched story with a dysfunctional news peg, by CNN. The first sentence name-drops the Child Nutrition Act reauthorization (“Healthy, Hunger-Free Kids Act of 2010″), but then goes on to talk about Ann Cooper’s re-vamp of Berkeley’s school lunches, not mentioning the Act again. The worst part is, the headline “School Lunch Gets an Upgrade” and the juxtaposition of these two elements (the Act and Ann Cooper’s work) make a reader think the Act will move us toward school lunch utopia. If you read the Grist articles above, you know it’s not so. We have to be on the lookout for misleading reporting, even from the likes of the top news outlets. I’m just happy that people everywhere are getting riled up about their school food. From Healthy Tara, the student who demanded ingredients lists, to the students who brought school lunch before the Chicago school board, change is in the air. But it’s up to all of us to stay informed and to make sure the change is meaningful to kids. “…yesterday representatives from Chartwells fanned out searching for the students who planned to give speeches-even asked to take some out of class–so they could talk to the kids about their presentations. How disastarous. I want to know if the company reps actually were allowed access to students. If so, I want the names of the administrators that allowed this BS. But I stumbled on some good news this week, too. Silicon Valley investors are getting into the business of sustainable agriculture. Like the new car companies (Tesla, Aptera), they’re trying to beat traditional business at its own game. This could be the beginning of a long-term solution. Maybe the proof-of-concept is already here, in this company that provides healthy food to schools that’s often local and organic, as reported by USA Today. This Huffington Post writer interviewed a director of a school lunch program that has been on the mend for several years now. The main lesson we can take away is that if your school starts revamping their school lunches, buy from them. They need economies of scale to make this work. This may be intuitive because you want the best food possible, but here’s the strategy we should follow: the more thoroughly they revamp the program, the more you should buy from them. Give them an incentive to revamp it. If you’re campaigning for better lunches, make that a point. Doom and gloom without a solution is just doom and gloom. Brandon Smith majors in both science and magazine journalism at Columbia College Chicago. He loves xkcd and has riled up health agencies in Ohio about not studying the effects of pollution. He’s at twitter.com/greenletters. Why am I interested in posting about alternatives to school lunches? Well, because many parents have the money and time to prepare meals at home for their children. It would be great if all parents had the ability to do this for their children every day. Not all of us are that lucky in life. Additionally, I believe it’s important to learn about what parents prepare for their children outside of school. I am Judy Thomas, a Virginia mom, gardener, home cook, crafter and part time college teacher. I guess there are two ways to approach sub-par school lunches: one is to change the system, the other is to opt out. I admire those who have tried to change the ways our kids eat, but am writing this for those who opt out of the school food system. I have been packing my son’s school lunches for nine years (and my work lunches for years before that). We are vegetarians, but that is not the main reason to pack, our school has a “vegetarian” option every day. No, I want my child to eat healthy foods and our schools just do not provide them. Before I go on, I have great sympathy for school cafeteria workers and managers. They are under tremendous fiscal pressure to make their school cafeteria self-supporting. They have to watch every penny like a hawk and the most common solution is to use cheap, pre-prepared, processed foods and commodity foods. I also feel for poor families, who cannot afford any alternatives to the school lunch, but many of us can. In our elementary schools, parents are able to eat lunch with their children. Watching what other kids ate (or would not touch) on their cafeteria trays reinforced my belief in providing lunches from home. Mystery meat and gray vegetables, cheap carbo fillers, and the “fruit cup” were unappealing, as was all the packaging and waste. Many kids ate only one solid food item for lunch, like pretzels. And washed it down with milk or juice. Most of the time, the home lunches seemed better, though not always (chips, cokes, doughnuts and “Lunchables” were sometimes included). For many years, my son’s tastes were simple-a PB &J sandwich or cheese sandwich, cheese and crackers and occasionally a thermos of pasta and cheese. To this I added some fruit (pre-cored and/or sliced to make it easy to eat), a cookie, some “juicy water” (water mixed with a little juice, now just water) and maybe a handful of crackers or “goldfish” on the “forbidden fruit” principle (I believe if you forbid your child to eat any convenience food, that food will become highly desirable to them). This year, my son started to balk a bit. The main reason is that he does not like carrying around a lunch bag all day (though sure likes dipping into it during class to get a snack when hungry!) and was tired of the uniformity of his lunches. So here are some typical “new” offerings for this school year: grilled cheese or “pizza” sandwiches on homemade bread (the latter with added tomato sauce) (well wrapped to stay warm), a thermos of pasta, ricotta and mozzarella, leftovers from dinner the night before (cheese blintzes, soup, lasagna, Indian lentils and rice), vegetable sushi (I purchase this as an occasional treat), hummus and baked tortilla chips or crackers, and PB, but now with apple/banana, honey and raisins. I add the usual fruit (though now will sometimes cut up pineapple or strawberries) and salty snack. It takes me on average about 10 minutes to prepare a lunch, and some of that is just reheating. I include food from the garden in his lunches when available- the soups, salsa and tomato sauce are made from my home canned tomatoes, and my pumpkin bread us from our garden pumpkins. I give him home canned or frozen fruit from the garden- much of the fresh fruit and veggies come in the summer, when he is out of school, and we all just gorge ourselves on it then! (Right now, we are into major brace$, so it limits his munching on raw carrots, and things like that). I love to cook, having learned from my beloved mother what NOT to do in the kitchen (she was of a generation that hated to cook and made the same food over and over. Shake and Bake frequently graced our table). I do have a luxury that many people do not- I work part time, much of it from home. But even when I worked full time, I was able to fit bread making and scratch cooking into my weeks and weekends. And that is an important key to making good lunches for your kids, and having tasty leftovers that you can reheat and pop in a thermos on those busy mornings. Bread can be made once per week, using an overnight method or refrigerator dough (and nothing is as wonderful as he smell of a loaf fresh from the oven!). Many people are intimidated by baking bread- it really is not hard (I know, I have been doing it for 25 years), does not take a lot of active time (just some time waiting for it to rise) and can be fit into a busy schedule. I first learned to bake from “The Tassajara Bread Book” (great instructions in “A Loaf for Learning”) and “Laurel’s Kitchen Bread Book,” both from the hippie-inspired 60’s and 70’s and somewhat more involved than you may want (now I just whip up a recipe every week, making a different, often sourdough, bread, but that does take some experience). When I was working, I mixed and kneaded bread either at night to bake in the morning or in the morning to bake when I got home from work, or waited until the weekend (we actually listen to a radio show as a family on Sunday afternoons and this is my bread-baking time). When my son was little, he was my baking helper and knows the basic ingredients of bread and how to knead it… and sure appreciates the final product! As a teen ager, he is not as interested in cooking, but this summer he is going to be “my kitchen buddy” helping me plan and cook one or two dinners per week. One bread-baking option for busy people is the approach taken in a new book “Artisan Breads in 5 Minutes a day” and a follow up book by the same authors. But even if you don’t want to learn to bake bread (but it is sooo satisfying! ), making simple, wholesome food in large batches (like spaghetti sauce, lasagna, blintzes or dumplings, soup, chili) that can be frozen in smaller batches and reheated in the mornings is the way to go for busy parents with several kids (while the food is reheating, you can be assembling other parts of lunch or dressing for work). I also bake a tray of bar cookies, cut, individually wrap and freeze them to put in school lunches. 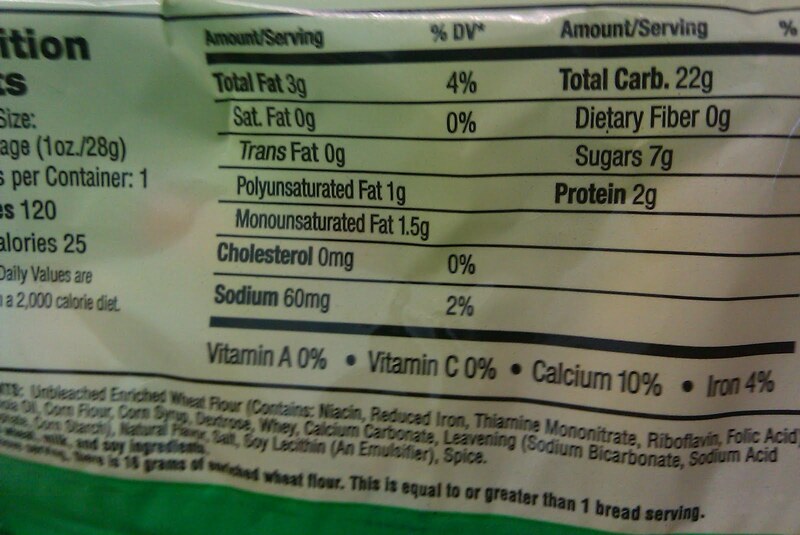 I know this isn’t exactly health food, but have you ever read the ingredients list on commercial cookies? And, again, think of the forbidden food principle. One thing I also do is I ask my son for his opinion each time I send something new to learn what he likes and what works well in his lunch bag. I know we are all busy and tired and frazzled, but if you have the desire and a little motivation, it is possible to change your eating habits- at home and at school! One approach is to start small- can you pack one healthy lunch per day? Then two, then…. (I have a garden blog for those of you interested in gardening, Central Virginia Organic Gardener, come visit and post any questions you might have).